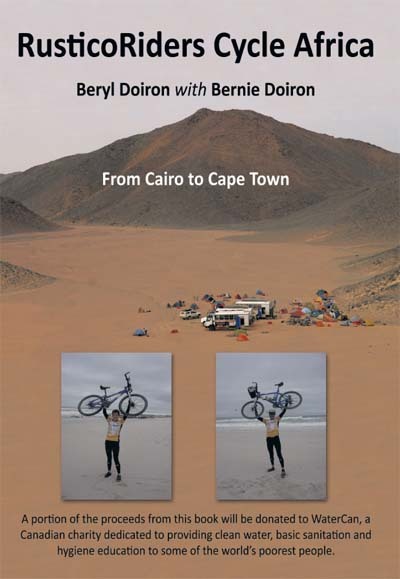 A four-month cycling trip from tip to tail of Africa â€“ in the company of like-minded individuals, accompanied by a support team â€“ was the perfect way for Beryl and Bernie Doiron to marry their joy of cycling with their love of travel and to escape the Canadian winter. Departing Cairo with its pyramids, they cycled through ancient Egypt, the deserts of Sudan, the mountains of Ethiopia, the lush rolling hills of Tanzania, Malawi, and Zambia, the beautiful terrain of Botswana and Namibia and along the Atlantic Ocean of South Africa to Cape Town: a fifth of the journey on clay, washboard, rock, sand, and dusty roads. It all made January to May 2008 a memorable summer: 10,000km down roads less travelled, time to interact with some of the worldâ€™s poorest people, pitching tents in desert and on bush ground and eating local foods. Again and again, the authors were struck by the welcoming faces of people with very few of lifeâ€™s amenities, who appear to live in peace and harmony with their surroundings. In small village and countryside, the people and lifestyle also triggered memories of early childhood, growing up on a family farm and nearby fishing village in Prince Edward Island, Canada.